On April 8, Russian President Vladimir Putin and Turkish President Tayyip Erdogan met in Moscow. The meeting comes as Russia is seeking to increase trade with Turkey, and Ankara has agreed to acquire Russia's S-400 air defense system. The larger picture is that Moscow and Ankara are now becoming a key alliance that will shape the Middle East in the years to come. This comes as Washington says Turkey's S-400 deal threatens relations with the US. In a statement put out by Russia, the in-depth exchange between Putin and Erdogan is sketched out. It included the signing of an agreement between the Russian Direct Investment Fund and the Turkey Wealth Fund "establishing a Russian-Turkish investment fund with €900 million in joint reserved capital." Putin said that in 2018, trade had reached almost $26 billion between the two countries. It notes that Russia's state energy corporation Rosatom is "building Turkey's first nuclear plant" and that the construction of the TurkStream pipeline and infrastructure is continuing. The S-400 contract is also on track. "We discussed other current and promising defense cooperation projects as well," Putin noted. Russia and Turkey have grown increasingly close over shared interests in Turkey. In 2015, the countries almost seemed on the verge of a major crisis after Turkey downed a Russian warplane on the Syrian border. Russian ambassador to Turkey Andrei Karlov was also assassinated in December 2016 by an off-duty Turkish police officer. But since then, a Russian-Turkish spring has arrived. Dozens of meetings in 2017 and 2018 – many of them regarding the conflict in Syria – cemented the countries' re-alignment. They met numerous times in Astana to hammer out de-confliction agreements, and then met in Sochi and Geneva. They both shared interests in opposing US policy in Syria. Russia wants the Americans out of Syria, and Turkey is outraged that the US is working with the Syrian Democratic Forces (SDF) – which Turkey views as linked to the Kurdistan Workers Party (PKK). A key to the new Russian-Turkish alliance is Turkey's acquisition of the S-400 air defense system. This would be unprecedented for a NATO country and shows that Turkey is growing very close to Russia. But the reasons for this are not widely understood. Turkey initially ordered the S-400 in December 2017. That was after a year in which Turkey thought it would have better relations under the Trump administration. US President Donald Trump and Erdogan met in May 2017. At the time, Russia had been warmer to the Kurdish groups in Syria, noting that "Syrian and Kurdish armed formations are taking part in combat operations against ISIS and are among the most combat efficient units." Putin said Moscow would "maintain working contacts with them." However, Turkey was surprised as the US began to make preparations for increased training of the SDF in the fall of 2017. Raqqa had fallen to the SDF and the US was making moves that indicated it might stay in eastern Syria. Plans that were once considered on how to defeat ISIS in Syria had been changed. For instance, a map that was prepared in the fall of 2015 had envisioned Raqqa being liberated in an operation that could involve Turkey helping. That concept survived into 2016, but the US soon understood that the SDF was the only force capable of taking Raqqa, not the Syrian rebels with Turkish backing. Manbij was liberated in August 2016 and Turkey launched an operation dubbed Euphrates Shield to prevent the SDF advance from continuing. Turkey's operation in and around Jarabulus in 2016 was a model for things going forward. It ended that operation in March 2017, but began preparations for operations in Idlib. Turkey entered Idlib in October 2017. In early December 2017, the US announced the move of the US embassy to Jerusalem. Turkey hosted an Islamic summit in Istanbul to back the Palestinians in response. Weeks later, Turkey and Russia finalized the S-400 deal. The S-400 deal must be understood in light of Turkey's operation in Afrin in northwest Syria. It began that operation in January 2018. It had first accused the US of training "terrorists" in eastern Syria. Wanting to isolate the US and SDF alliance, Turkey decided that it would strike at the People's Protection Units (YPG) in the Kurdish area of Afrin. The YPG is linked to the SDF and also the PKK, and Turkey wanted to show that while it couldn't strike at Manbij with US troops there, it could go into Afrin. It met with the Russians on the eve of the operation, and Russia used its influence with the Syrian regime to give Turkey approval. Russian air power in Syria would not stop Turkey from entering Syrian airspace. This was important, and the S-400 deal is part of the Russian-Turkish pact over Syria. Since then, Russia and Turkey have signed another agreement on Idlib in September 2018 to create a buffer zone and stop a Syrian regime offensive into Idlib. This cements Turkey's role in northern Syria. Turkey has also made the Syrian rebels dependent on Ankara and has promised to help Syrian refugees move back to northern Syria, including to Afrin and other areas. At any time, Russia could decide to oppose Turkey's use of Syrian airspace, but the S-400 deal might be jeopardized. Turkey began constructing sites for the S-400s, according to reports, in September 2018, the same time the Idlib agreement was signed. Since then, Ankara has reiterated it will definitely acquire the Russian system, presenting a timeline in October 2018 saying there is "no going back" in February 2019 and saying it "can't quit" the deal in March. At the recent April meeting, Erdogan and Putin discussed the S-400 again. They also discussed Idlib, the importance of the "territorial integrity" of Syria and "the division of the country into zones of influence is unacceptable." The S-400 deal is now deeply entangled in the emerging Russia-Turkey alliance, and also a key part of linkage to the Idlib issue and Turkey's interests in eventually launching an operation against the SDF in Manbij and other areas – It will need Russian approval for that. If Turkey were to walk away from the S-400 deal due to US threats that the deal harms relations, it would mean Russia could close Syrian air space. 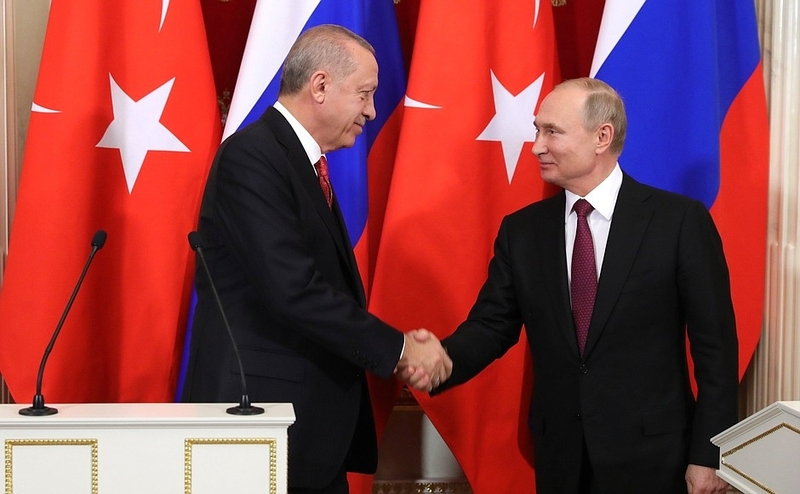 Turkey and Russia are now in such a deep bargain – from Idlib to the S-400 and TurkStream and the nuclear power plant – that they cannot go back. Russia understands this. Moscow understands the S-400 is a key leverage over Turkey. But Turkey also has leverage with its role in northern Syria. These two countries now need each other to such a degree they cannot end the embrace. US commentators and policy-makers sometimes think that if only Washington had done this or that regarding Turkey and Russia, that each country might have changed their trajectory. But there are so many common interests now between Russia and Turkey that a pivot would be difficult. It is no surprise they find themselves on the same side regarding Iran sanctions, and also criticizing the US decision to designate the IRGC as a terrorist group. Turkey made that clear on April 10. Washington now looks across from eastern Syria and sees that Turkey, Russia and Iran are all eagerly opposed to what the US is doing, even as the US seeks to ramp up tensions with Iran.